Add this elegant lingerie chest to your master bedroom for extra storage and great style. 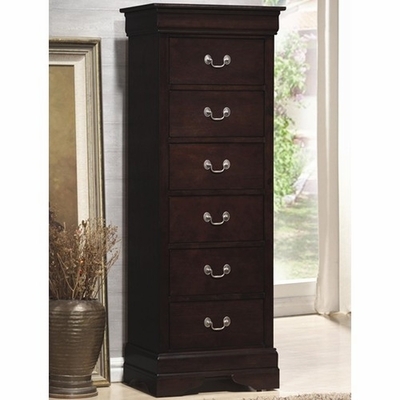 The slim chest offers six drawers to store all of your essentials, ideal for smaller items. Fit this chest easily into a small bedroom or tight space, featuring clean Louis Philippe style that is sure to complement your home decor. The rich dark cappuccino finish, shapely molding, block feet, and sleek silver hardware create a look you will truly love.